3. Dissolve corn starch in water, add garlic sprouts, mix well, the dish is ready. A right amount of Chinese prickly ash powder could be added according to your personal taste. Allergy Advice: Contains Soy, Soy Bean, Wheat, Sulphites. 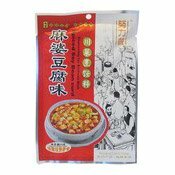 Ingredients: Low Erucic Acid Rapeseed Oil, Palm Oil, Broad Bean Sauce (Broad Bean, Chilli, Water, Salt, Flavour Enhancer (E621)), Chilli (9.29%), Salt, Garlic, Ginger, Soy Sauce (Water, Salt, Soy Bean, Wheat Flour), Fermented Soy Bean (Soy Bean, Water, Salt, Wine, Wheat Flour, Spices), Water, Flavour Enhancers (E621, E635, E627) (Sulphites). Simply enter your details below and we will send you an e-mail when “Seasoning For Spiced Soy Beancurd (白家麻婆豆腐醬)” is back in stock!